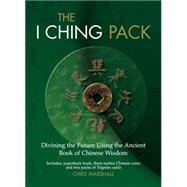 I Ching, the ancient Chinese art of divination, is as relevant today as ever—and The I Ching Pack helps you clear your mind and gain a fresh perspective on any problem, from work to romance. In addition to two packs of Trigram cards and a 160-page instructional book, this unique kit contains three special oracle coins. Just throw the coins six times, and consult the charts to see how they fell and discover the meaning of each hexagram. Once you find the interpretation, you're ready to make the right decision for your future! Chris Marshall is an esoteric writer working in both Britain and Europe, and a student of many occult fields. He has been the astrologer for Marie Claire magazine in Britain and Germany, and writes regular special features and articles for many national magazines. He has been interviewed on British television and contributed to various television programs. In addition to writing and teaching, Chris gives private consultations in various techniques, including astrology, Tarot, and the I Ching. He has spent several years studying a wide range of spiritual techniques and has run workshops and given lectures from Iceland to Europe.